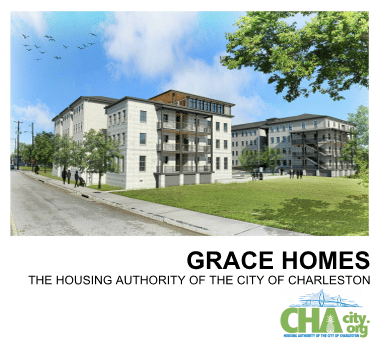 Grace Homes is an affordable housing development for the Housing Authority of Charleston. Located in the Eastside neighborhood on the Charleston peninsula, the project will include 62 units total, with a mix of 1, 2, and 3-bedroom units, divided between two separate 4-story buildings on the same site. Other features will include a 20-space surface parking lot, central laundry room and a 4th floor Community Room with roof terrace. The project is scheduled for completion in February of 2020.